Most people choose to straighten their teeth to achieve a more appealing smile and improve their oral health. Even if you had braces as a child, your teeth might have shifted and are probably misaligned, which results in many adults suffering from crooked teeth. While the options for straightening teeth used to be restricted to bracket and wire metal braces, there are now more options available for creating a beautiful smile. When we think of braces, we automatically think about the traditional bracket and wire braces of two decades ago. Traditional braces are not what they used to be. Although they are still comprised of brackets and wires, the brackets are much smaller, come in colors for fun or concealment, and use fewer rubber bands to reduce the amount of wounds in the mouth. While these are not the choice of many adults, they are still widely recommended for children and adolescents because treatment can be completed in 12 months. Invisalign® is the new age, revolutionary way to straighten your teeth. Instead of brackets and wires, clear removable plastic aligners are used to gently move teeth. Digital images are taken to map out treatment needs, and a custom treatment plan is made for each patient to determine how many liners will be needed. Most patients will wear 20 to 30 liners over 12 to 18 months. The liners are worn 20 to 22 hours a day and can be removed for eating and oral hygiene. Because the liners are clear, this is a popular choice for adults who want to maintain a professional appearance or don’t want anyone to know that they are straightening their teeth. Porcelain veneers are the complete makeover and a quick fix for mild to moderately crooked teeth. They are also used to improve the size and shape of teeth, if needed, to fill in gaps. Veneers are porcelain shells that are fitted over the natural teeth. Impressions are taken and sent off to a dental lab where custom veneers are made. You will then return to have the veneers bonded to the teeth. Removal of a thin layer of enamel is needed to fit the veneers over the existing teeth. 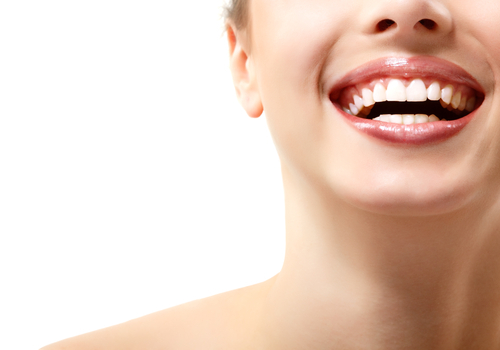 For more information about straightening your teeth or to schedule a consultation, please contact us at 310-273-0111. This entry was posted on Wednesday, September 19th, 2018 at 11:30 am	and is filed under Invisalign®, Porcelain Veneers. You can follow any responses to this entry through the RSS 2.0 feed. Both comments and pings are currently closed. Are you debating whether you should get porcelain veneers or Invisalign®? If you’re looking to improve your smile, one of these could be an excellent choice for you. Whichever option you choose, you could end up with the straight, beautiful smile you’ve always wanted. Porcelain veneers are thin sheets of porcelain that are permanently affixed to your teeth. They can correct a variety of issues, such as discoloration, cracks, chips, breaks, shape issues, and crookedness. 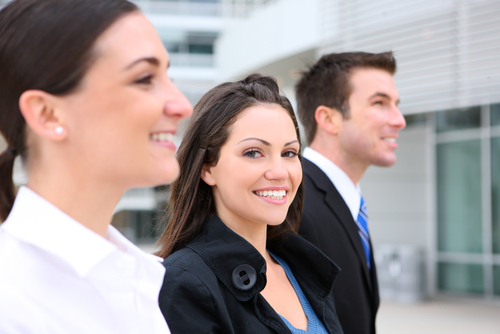 With just two office visits, you can have your teeth fitted with porcelain veneers to improve your smile. 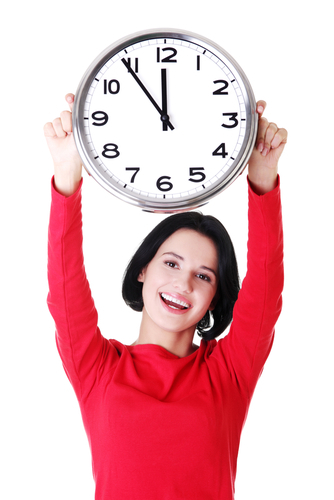 Quick treatment process: Treatment with veneers takes only two office visits to complete. Treatment with Invisalign® can take well over a year and requires regular office visits. Color correction: Veneers can be affixed over discolored teeth. They are also stain-resistant and made to match the surrounding teeth for a seamless smile. Invisalign® does not correct tooth color. Shape correction: Veneers can improve the appearance of unevenly shaped teeth, whereas Invisalign® can only bring teeth into better alignment. Elimination of crookedness and gaps: Veneers can disguise gaps and crooked teeth with just two treatments. Invisalign® can take many months to do the same. Disguising cracks: Veneers can cover cracks, chips, or breaks in teeth, but Invisalign® cannot. Painless treatment: Veneers are a painless treatment, while Invisalign® may cause some discomfort during the teeth shifting process. Versatile uses: Veneers have many versatile uses and can correct tooth color, gaps, crookedness, bite issues, and cracks. Invisalign® has a more limited goal to straighten teeth and eliminate gaps and bite issues. Invisalign® is a long-term tooth-straightening process. Using clear, custom-made alignment trays that fit snugly over your teeth, Invisalign® slowly shifts your teeth into place. Each week or two, you swap your trays for a new set so that over time, your teeth continue to shift. Invisalign® permanently straightens teeth with a solution that is far more cosmetically appealing than braces and is good for long-term dental health. One-time solution: While the length of treatment can last over a year, Invisalign® is a one-time treatment. Veneers need to be replaced every five to 10 years, which can become expensive and inconvenient over time. Better for enamel: Invisalign® trays do not damage the enamel. Before veneers are cemented to the teeth, treatment requires an irreversible removal of surface enamel that can weaken the teeth. Elimination of crookedness and gaps: Invisalign® straightens the teeth and permanently eliminates gaps so that the teeth fit naturally and snugly in place. Veneers make teeth look straight and gap-free, but the actual teeth are unchanged. Dental health: Invisalign® corrects dental imperfections, while veneers cover them up. By straightening teeth, Invisalign® improves dental health and guards against tooth decay and gum disease. Veneers improve the appearance of the teeth, but any underlying tooth or gum problems will still exist beneath them. 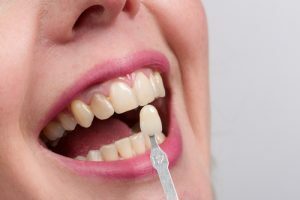 Bite: Invisalign® can even correct many significant issues with your dental bite, and this is not always possible with veneers. Color matching: Invisalign® does not adjust tooth color. However, even though porcelain veneers do, veneers do not respond to any subsequent natural discoloration or teeth whitening treatments once they are fitted to the teeth. This means that they may not always match the surrounding teeth over time. Rotated teeth: Invisalign® turns rotated teeth so that they are straight and aligned. Veneers can make many teeth appear straight but are not often recommended for rotated teeth. 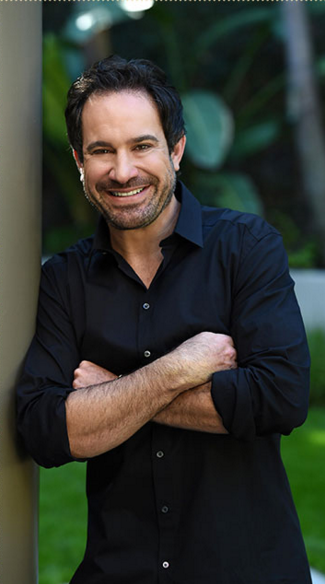 Dr. Sands offers both porcelain veneers and Invisalign® at his Beverly Hills dental practice. To find out more about these treatments, request your appointment with Dr. Sands. Call (310) 273-0111 or complete our online contact form to reach us today. This entry was posted on Tuesday, February 13th, 2018 at 12:13 pm	and is filed under Invisalign®, Porcelain Veneers. You can follow any responses to this entry through the RSS 2.0 feed. Both comments and pings are currently closed. Since metal braces are distinctly more popular among teenagers, many adults view Invisalign® as the clear choice for correcting their crooked or crowded teeth. Invisalign® patients can go about their regular activities as they speak, smile, and laugh without anyone noticing they are straightening their teeth at the same time. 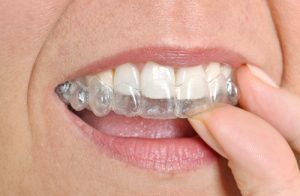 Gradually, over several months, a series of clear trays customized to fit your teeth will gently shift them into the proper alignment. You must wear the trays 22 hours per day, removing them only to clean them or to eat. The length of treatment with Invisalign® varies among patients, but most adults will see final results after one year, and teenagers see results within one to two years. Throughout the process, Invisalign® patients will not have to deal with the extra maintenance, diet restrictions, or uncomfortable mouthful of metal associated with braces. The cost of Invisalign® is usually comparable to the cost of metal braces unless significant correction is needed. Significant correction could include improving a severe overbite, rotating a tooth, or moving the teeth vertically. In some cases, metal braces are a better option. After assessing your teeth, Dr. Sands will determine the treatment that will best meet your needs and inform you of the estimated cost. The thin Invisalign® trays fit smoothly and comfortably over the teeth. There is no risk of gum irritation or mouth sores that can often result from metal wires or brackets. Since Invisalign® is completely removable and not worn while you eat, there are no diet restrictions. With braces, you should be prepared to avoid eating popcorn, chips, apples, corn on the cob, chewy candy, and many other favorite foods and snacks. If you are interested in Invisalign®, please schedule a consultation to see if this treatment is right for you. Please call Dr. Kevin Sands’ Beverly Hills practice at (310) 27-0111 or fill out our online contact form to learn more. This entry was posted on Thursday, September 25th, 2014 at 11:31 pm	and is filed under Dental Treatment, Invisalign®. You can follow any responses to this entry through the RSS 2.0 feed. Both comments and pings are currently closed. Did you know having straight teeth can improve your speech? Many people have speech impediments that are caused by a hearing impairment or by other circumstances that are not easily treatable. More often than not, a speech disorder is caused by malocclusion (crooked or misaligned teeth), and can be easily treated with straightening dental procedures such as porcelain veneers, braces, or Invisalign®. When malocclusion affects a person’s speech, it is usually because of how the tip of the tongue is placed on the teeth when forming the “t,” “d,” and “n” sounds. Sometimes, in an effort to counteract their impediment, the person can overcompensate and instead develop a mild to moderate stutter. A speech impediment like a lisp can be distracting, but stuttering or mispronouncing words can have a devastating effect on a person’s confidence, which is one of the many reasons one should seek treatment. If the appearance of braces is a concern, Invisalign® is the ideal option because it straightens the teeth undetectably. A series of custom fit trays are given to the patient in two-week increments to progressively straighten teeth over a period of one to two years. This treatment can correct most cases of malocclusion, such as gaps, overbite, underbite, and crowded teeth. While braces require some diet restrictions, Invisalign® does not require patients to restrict their diet in any way, as the trays are to be removed while eating. Porcelain veneers are another option to restore a straight smile and improve speech. Veneers are the best choice for those who want a straight smile within a little amount of time, as final results are seen in only two visits to the dental office. As thin pieces of porcelain that cover the front of the teeth, veneers have the added advantage of disguising many other aesthetic issues a patient may be concerned about, such as cracks, chips, discolorations, or misshapen teeth. Diet restrictions and special precautions are also unnecessary with veneers; however, patients should always practice regular oral hygiene to maintain their healthy, beautiful smile. Since malocclusion can worsen over time or lead to other problems, such as chips in the teeth, jaw pain, and chronic headaches, it is important to seek correction as soon as possible. Whatever your concern, Dr. Kevin B. Sands can help determine if malocclusion is the cause. To schedule an appointment and to find out more about these dental procedures, please schedule an appointment by calling (310) 273-0111. For your convenience, you may also fill out our online contact form. This entry was posted on Tuesday, April 22nd, 2014 at 8:00 am	and is filed under Invisalign®. You can follow any responses to this entry through the RSS 2.0 feed. Both comments and pings are currently closed.